A year and half ago, I was traveling in India. It was a cold January morning in Delhi, and my cousin and I had managed to snag a room in a beautiful guesthouse on the Jawaharlal Nehru University campus. As usual, we’d spent most of the night catching up with friends in the dhabas (street eateries) that JNU is rather rightly famous for, and we’d managed to crash into bed at around 3 AM. At 6.30 AM there was a knock on the door of our room. Bleary eyed, I opened the door to be greeted by a familiar, yet forgotten sight, the tea boy. ‘Chaaiya?’ he asks me, liltingly, with a question mark on noticing my sleepy state. After rubbing my eyes for a couple minutes, I realised what he was offering, and absolutely delighted, I handed over a few rupees, and grabbed a couple lotas (little steel tumblers) of steaming hot tea off him. As I sipped on that hot, sweet and fragrant liquid, I sat on my bed and regaled my (still sleeping) cousin with tales of that tea, and all my university memories that were inextricably bound up in them. Such is the power of that little cup of chai in India! Come to think of it, what is more quintessentially Indian than sipping a steaming hot cup of chai in a street dhaba (eatery), the hot beverage redolent with spices, the heady aroma suffusing your senses, gently teasing you awake after a long hard night of carousing, er, studying? That’s chai for you. Chai is Indian tea, usually milky, strong and sweet, with lots of spices. It is usually made in pots that sit over a fire, and stirred and stewed until it achieves its characteristic golden colour and all those added spices are beautifully infused into it. Popular all over India, it is enjoyed by a wide variety of people, from the caricature of the bureaucrat sitting in his hot dusty office to the bullock cart driver, sitting on the roadside, sipping his tumbler of chai. I am not the foremost authority on chai; however, all those cups drunk in various parts of India have given me an understanding of this refreshing, yet comforting drink that is beloved of most Indians. At its simplest, chai is a combination of strong black Indian tea, usually granulated, rather than loose leaf, milk and sugar, stewed on a stove top until its strong enough to chase away any lingering remnants of sleep or lethargy. In many ways, it is very similar to strong builder’s tea from England and probably used for the same purpose too. Whichever way you look at it, this marvelous concoction is a delight, and is steadily gaining popularity in the Western world. India has always been known for its teas. From the robust strong Assam tea, to the delicate infusions of Darjeeling, to the lesser known, but no less delicious Nilgiri tea, Indian teas are both popular and sought after. Assam tea was embraced by the British, who at that time were trying to find an alternative to the monopoly of Chinese tea. After a few unsuccessful attempts at transplanting Chinese tea in the valleys of Assam and Darjeeling, the British decreed that Indian tea was much superior. Tea was then grown in plantations all over the North East of India, and generically called Assam Tea, after the largest of the North Eastern states. Around 60% of tea exported by India is grown here. This tea is mainly used as a blend with other teas; however, pure Assam tea is now getting more and more popular. Darjeeling tea, on the other hand, is more characteristic of Chinese teas, with its light colour and delicate fragrance. Darjeeling tea is highly sought after by tea connoisseurs and in recent times has become some of the most expensive tea in the world, particularly single estate teas, like the highly expensive Silver Tips or first flush Darjeelings. Nilgiri tea, as opposed to Darjeeling or Assam, is grown in the south of India, particularly on the slopes of the beautiful Nilgiri Hills or the Blue Mountains. The Nilgiri hills (along with Sri Lanka) are home to one of the more common teas in the world, the Orange Pekoe. Sadly, the original Nilgiri tea is used more to create tea blends, as well as granulated tea for the mass market, as it is considered a cheaper variety of tea. It is, however, enjoying a renaissance among more informed tea drinkers, though, and one can hope that this beautiful, dark and fragrant tea will become as well known as other Indian teas. 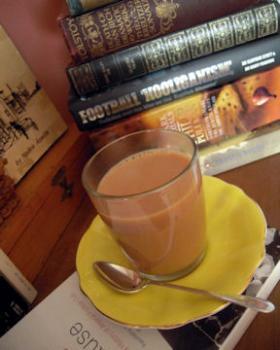 Masala chai, on the other hand, has much humbler origins. While the word ‘chai’ actually means tea, (which is why you should never ask for ‘chai tea’, you are basically asking for ‘tea tea’), it is more often associated with tea infused with spices, or masala chai. Spices were infused into tea that was drunk by Indians, with the likely reason being to hide the fact that the tea was inferior to the one exported by the British. As time passed, however, masala chai or chai infused with spices became more and more popular, not just in India, but all over. Chai is now served all over the world, and of course, the actual taste and flavour varies wildly from person to person, with everyone and its Starbucks claiming to make the best chai. Chai, however, is an intensely personal taste, and the recipe varies from family to family and from state to state in just India itself. There is really no set recipe for chai, and if anyone claims otherwise, they are not being true to the spirit of chai. Everyone claims the best and most authentic recipe for chai and of course this leads to the question, so what actually are the spices used to make chai? The combination of spices for chai has always been a hotly debated issue for Indians. People swear by their own combinations, and there is always a big question mark over what makes ‘real chai’. Some claim that all you need for chai is black tea, milk, sugar and some crushed ginger. 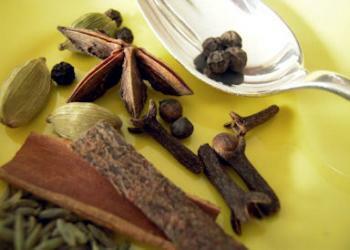 Others claim a long a list of exotic spices, added to the stewing tea. Some others claim that the true flavour of chai comes from cardamom. Mint has been mooted as an unusual flavouring for chai. Some households make their chai with condensed milk. Whatever be the combination of spices, no one disputes the health claims of this steaming drink. An infusion of spices, herbs and black pepper in a hot cup of chai has been used to cure everything from the common cold to an upset stomach. 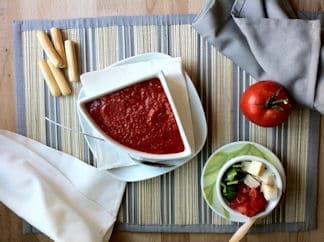 It is reminiscent of stormy and rainy monsoon days and the perfect antidote to cold winter’s blues. There is, and should be, no snobbery associated with chai. If there is, they have missed the whole point of chai. It is probably the most democratic drink you will find, enjoyed by everyone from the street sweeper to the prime minister. 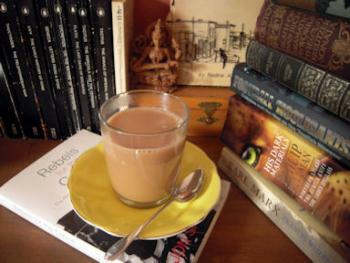 To put it poetically, Chai is India! With all its chaos and contradictions, yet sublime and spiritual, hot, sweet and dusty, loud and quiet at the same time, highbrow, yet common, manically busy, but somehow blending together in a magical way. Anyway you look at it, it is an experience to be savoured and remembered for life. Around 4 – 6 tsp of loose strong black tea (or 1 – 2 black tea bags) *I use my precious Nilgiri tea that I smuggled into Canada. Take the seeds out of the cardamom pods. In a mortar and pestle, crush all the spices coarsely. Don’t worry about getting them into a fine powder. Mix the loose tea (or teabag) and the spices in a teapot. Add the ginger and just boiled water and let it steep for at least 3 – 5 minutes. This tea will be quite strong, so if you prefer a lighter tea that you will drink without milk, then steep for only 2 minutes. Using a fine mesh strainer, pour the tea into mugs or teacups, add milk or cream and sugar to taste, and serve.